George Vanderbilt introduced his new home to family and friends on Christmas Eve 1895 with a wonderful celebration that we continue today. 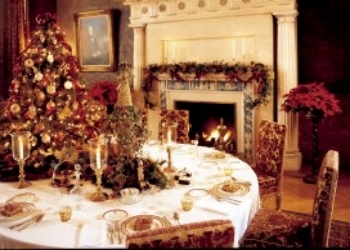 Enjoy America's largest home decorated with dozens of Christmas trees, hundreds of wreaths, bows, and poinsettias, miles of evergreen garland, and thousands of ornaments. 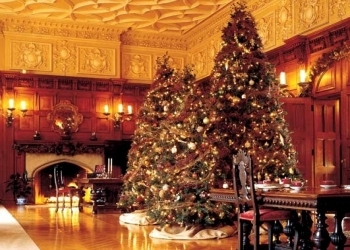 Christmas at Biltmore during the daytime includes access to Biltmore House, the Gardens and Antler Hill Village & Winery. The village links to the Winery, where visitors may take a complimentary guided tour culminating with a complimentary wine tasting. Biltmore House is a Ch�teauesque-styled mansion near Asheville, North Carolina, built by George Washington Vanderbilt II between 1889 and 1895. 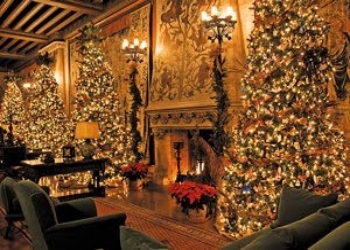 It is the largest privately-owned home in the United States, at 135,000 square feet and featuring 250 rooms. Still owned by one of Vanderbilt's descendants, it stands today as one of the most prominent remaining examples of the Gilded Age, and of significant gardens in the Garden � la fran�aise and English Landscape garden styles in the United States. In 2007, it was ranked eighth on the List of America's Favorite Architecture by the American Institute of Architects. 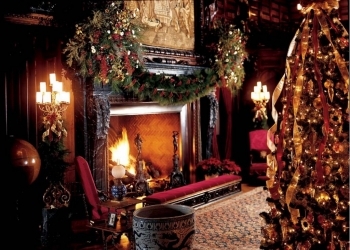 In the 1880s, at the height of the Gilded Age, George Washington Vanderbilt, youngest son of William Henry Vanderbilt, began to make regular visits with his mother, Maria Louisa Kissam Vanderbilt (1821�1896), to the Asheville, NC area. He loved the scenery and climate so much that he decided to create his own summer estate in the area, which he called his "little mountain escape", just as his older brothers and sisters had built opulent summer houses in places such as Newport, Rhode Island, and Hyde Park, New York. View of the west side of the house from the Shrub gardenIn an attempt to bolster the Depression-driven economy, Vanderbilt's only child, Cornelia Stuyvesant Vanderbilt, and her husband, John Amherst Cecil, opened Biltmore House to the public in March 1930. Family members continued to live there until 1956, when it was permanently opened to the public as a house museum. Visitors from all over the world continue to marvel at the 70,000 gallon indoor swimming pool, bowling alley, early 20th century exercise equipment, two-story library, and other rooms filled with artworks, furniture and 19th-century novelties such as elevators, forced-air heating, centrally-controlled clocks, fire alarms and an intercom system. The estate remains a major tourist attraction in Western North Carolina and has over 1 million visitors each year. The grounds include 75 acres of formal gardens, a winery and the Inn on Biltmore Estate, a AAA four-diamond 213-room hotel.